I love making fun food for holidays or any other occasions. 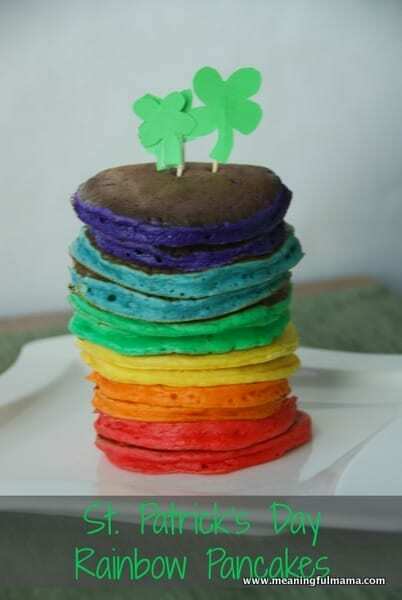 For St. Patrick’s Day, I thought it would be really fun to make a stack of rainbow pancakes. If you are in need of other ideas for St. Patrick’s Day food, click back for more ideas. If you want a really simple breakfast idea, check out how to amp up your Lucky Charms. This idea is simple. It takes my favorite fluffy pancakes recipe (the only pancake recipe you’ll need), and I added food coloring. That’s it. Here’s the before and after shot of the batter. Sorry the after shot is blurry. Have I mentioned how wonderful my husband is? 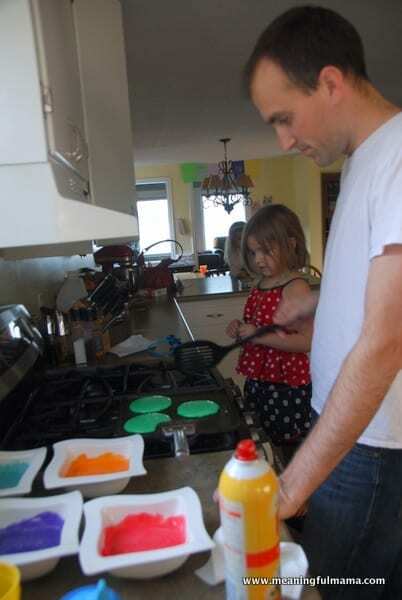 He was on self-appointed pancake duty this morning – after I had mixed up all the colors, of course. 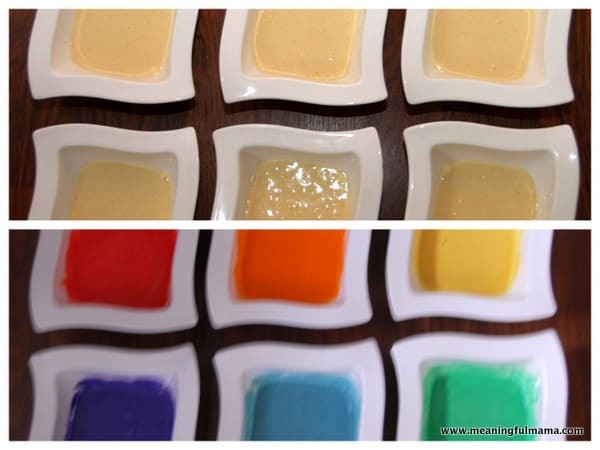 I have tried to do colored pancakes before and they comes never come out like this! The batter comes out fine, but when I cook them they turn brow and they are only colored on the inside! What did you do to make the colors stay so bright? Hmmm…I have no idea. I did use Wilton coloring gel rather than normal food coloring. You can tell that the tops are a bit brown, but the real color comes out on the sides. I think this pancake recipe is the best: https://meaningfulmama.com/2012/11/my-favorite-fluffy-pancake-recipe.html. Maybe the fluffiness of this recipe contributed to the bright colors on the sides. Good luck!